The Master of Suspense -- now on Broadway! If you've been following me on Twitter, you might have heard the exciting news. 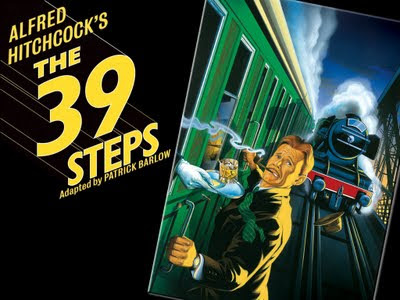 On September 1, I'll be delivering a brief lecture and discussion following a performance of the hit play The 39 Steps. I'm going to Broadway, baby! Did you catch that? Four actors playing 150 characters. I'm guessing the backstage action would have to be crazier than anything happening under the spotlight. That's where I come in, believe it or not. Following each Tuesday's performance, they host a post-show presentation called Talkback Tuesday. Audience members can stick around to hear Hitchcock experts, actors, comedians and others talk about the play. Other hosts have included include Saturday Night Live comedian Rachel Dratch, Hitchcock scholars Murray Pomerance and Sid Gottlieb and, now, yours truly. I will speak for a few minutes on some kind of scholarly subject. Perhaps I'll discuss the novelist John Buchan, whose book The Thirty-Nine Steps provided the basis for Hitchcock's movie and whose others works exerted a big influence on the director. Check back here for a sneak preview. Following that, the actors will come out on stage and I'll moderate a discussion between them and the audience as they talk about the play, the multiple costume changes, etc. Sounds like a really fun night. And who knows where it will lead? After all, if I can make it there, I can make it anywhere! I saw this show in London last year. It's virtually word-for-word and scene-for-scene from the Hitchcock film, but with added gags and TONS of Hitchcockian in-jokes thrown in. Very funny, fast-paced and engaging. Simply, but ingeniously staged. I'm sure you'll love it. i think they are still showing it in london actually so i am going to see it ASAP. One of those 'must do but haven't done yet' type of things. Thanks for stopping by! This really is a highlight for me! Stay in touch, they've sent me some free tickets and other swag to hand out. I'll be talking about that on Twitter. Just follow @joelgunz.